Having a superior, differentiated view is very difficult these days — if we’re talking about short-term trends. Long-term projections are a different game entirely — one in which judgment, experience and harder-to-quantify information play a far bigger role in forecasting. We believe that the majority of a company’s value lies in its long-term future cash flows — beyond the next one, two, three or even 10 quarters. Artificial intelligence (AI), quant funds, high-frequency trading, big data — these terms get thrown around a lot these days and can create confusion and uncertainty. Case in point: Tesla CEO Elon Musk has said that AI is more dangerous than nuclear weapons, with Facebook CEO Mark Zuckerberg calling such statements “pretty irresponsible.”1 Beyond such dramatic statements, it’s clear to see that quants and high-frequency traders (HFTs) account for more than half of all US equity trading. How does all of this fit into the investing world as we see it? The portfolio managers for the Invesco Canada Equity Small Cap team (which manages funds in both the US and Canada) believe that the foundation of any good investment is having a differentiated and informed view versus the market consensus (which the renowned investor Benjamin Graham once famously called “Mr. Market”). If we take a step back and think about the ingredients of a differentiated view, we believe that, on a high level, this requires using all of the data sources available to us and/or utilizing a more rational thought process. Of course much has changed since the days when Warren Buffett used to go to Moody’s or the SEC’s office to get his hands on company information that wasn’t available elsewhere. In fact, it’s quite the opposite today. Investors have access to a proliferation of data, from online access to detailed company reports, to “alternative data” sold by market-data companies. These alternative data run the gamut from consumer credit card purchase data to satellite images of retailers’ parking lots. Combine this cornucopia of data with today’s quantitative funds, which rely on computer models to select investments. These funds have come a long way since the late 1980s and today are stacked with PhDs using sophisticated AI – and it’s easy to see that having a superior, differentiated view is very difficult these days — if we’re talking about short-term trends. A lot of money chases this quarter’s or next quarter’s results. Why do we do this? We believe that the majority of a company’s value lies in its long-term future cash flows — beyond the next one, two, three or even 10 quarters — and that’s why it’s critical for us to understand the long-term trends that shape what the company will look like five years down the road. This is how we on the Invesco Canada Equity Small Cap team think about investment horizons and how we seek to differentiate ourselves from the algorithm wars that dominate the short-term landscape. We approach all companies with the mindset of a business owner, getting to the bottom of the drivers that matter in the long run. 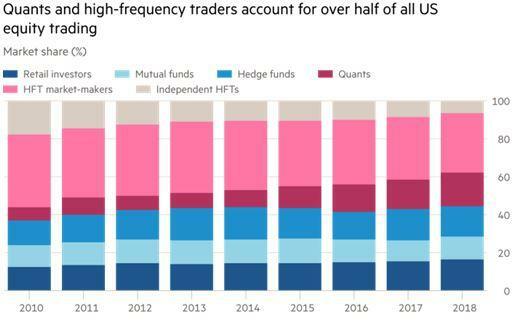 This is borne out in the consistently long average holding periods of 4.6 to 8 years across our small-cap funds, which stands in stark contrast not only to quant funds, but even to many US mutual funds. Learn more about Invesco Select Companies Fund and Invesco Select Opportunities Fund. 1 Source: CNBC, “Elon Musk: ‘Mark my words – A.I. is far more dangerous than nukes,’” March 13, 2018. Neither Facebook nor Tesla are holdings of the funds mentioned. The opinions referenced above are those of the author as of April 3, 2019. These comments should not be construed as recommendations, but as an illustration of broader themes. Forward-looking statements are not guarantees of future results. They involve risks, uncertainties and assumptions; there can be no assurance that actual results will not differ materially from expectations. Quantitative funds (or “quant funds”) rely on computer models to select investments. Holding cash or cash equivalents may negatively affect performance. Because the Fund may hold a limited number of securities, a change in the value of these securities could significantly affect the investment value of the Fund.